This document describes use cases and requirements for the development of the Media Fragments 1.0 specification. It also specifies the syntax for constructing media fragment URIs and explains how to handle them when used over the HTTP protocol. It finally includes a technology survey for addressing fragments of multimedia document. This is the First Public Working Draft of the Use cases and requirements for Media Fragments specification. It has been produced by the Media Fragments Working Group, which is part of the W3C Video on the Web Activity. This document currently describes both use cases and requirements for media fragments and a preliminary specification of the syntax for constructing media fragment URIs together with the expected behavior regarding how to handle these URIs when used over the HTTP protocol. The group does not expect this document to become a W3C Recommendation. This document may be split into more documents later on. More precisely, the sections 3, 4, 5 and 8 will be included in a forthcoming WG Note while the sections 6 and 7 aim at being the core of the Media Fragments W3C Recommendation. Please send comments about this document to public-media-fragment@w3.org mailing list (public archive). Audio and video resources on the World Wide Web are currently treated as "foreign" objects, which can only be embedded using a plugin that is capable of decoding and interacting with the media resource. Specific media servers are generally required to provide for server-side features such as direct access to time offsets into a video without the need to retrieve the entire resource. Support for such media fragment access varies between different media formats and inhibits standard means of dealing with such content on the Web. This specification provides for a media-format independent, standard means of addressing media fragments on the Web using Uniform Resource Identifiers (URI). In the context of this document, media fragments are regarded along three different dimensions: temporal, spatial, and tracks. Further, a fragment can be marked with a name and then addressed through a URI using that name. The specified addressing schemes apply mainly to audio and video resources - the spatial fragment addressing may also be used on images. The aim of this specification is to enhance the Web infrastructure for supporting the addressing and retrieval of subparts of time-based Web resources, as well as the automated processing of such subparts for reuse. Example uses are the sharing of such fragment URIs with friends via email, the automated creation of such fragment URIs in a search engine interface, or the annotation of media fragments with RDF. This specification will help make video a first-class citizen of the World Wide Web. The media fragment URIs specified in this document have been implemented and demonstrated to work with media resources over the HTTP and RTP/RTSP protocols. Existing media formats in their current representations and implementations provide varying degrees of support for this specification. It is expected that over the time, media formats, media players, Web Browsers, media and Web servers, as well as Web proxies will be extended to adhere to the full requirements given in this specification. The keywords MUST, MUST NOT, SHOULD and SHOULD NOT are to be interpreted as defined in RFC 2119 . This section lists a number of conditions which have directed the development of this specification. These conditions help clarify some of the decisions made, e.g. about what types of use cases are within the realm of this specification and which are outside. Spelling out these side conditions should help increase transparency of the specifications. A media resource for the purposes of this Working Group is defined along a single timeline. It can consist of multiple tracks of data that are parallel along this timeline. These tracks can be audio, video, images, text or any other time-aligned data. The main interest of this group is in audio and video. A media resource also typically has some control information in data headers. These may be located at a particular position in the resource, e.g. the beginning or the end, or spread throughout the data tracks as headers for data packets. There is possibly also a general header for the complete media resource. The data tracks are typically encoded in an interleaved fashion, which allows for progressive decoding. All of this is provided in a single file. Media fragment URIs will work within the boundaries of existing standards as much as possible, in particular within the URI specification RFC 3986 . Media fragments are a representation of the parent resource and should not create a new resource, in particular not a new resource of a different Internet media type (or MIME type). Note that there are use cases for creating a new resource, such as the extraction of a thumbnail from a video. These are currently outside the scope of this document. Resources delivered as a response to a media fragment URI request should be valid media resources by themselves and thus be playable by existing media players / image viewers. The entire resource should be accessible as the "context" of a fragment via a simple change of the URI. The media fragment URI - as a selective view of the resource - provides a mechanism to focus on a fragment whilst hinting at the wider media context in which the fragment is included. A media fragment URI should create only a single "mask" onto a media resource and not a collection of potentially overlapping fragments. The main protocols we are concerned with are HTTP and RTSP, since they are open protocols for media delivery. Media fragments should preferably be delivered as byte-range subparts of the media resource such as to make the fragments an actual subresource of the media resource. The advantage of this is that such fragments are cachable as byte ranges in existing caching Web proxies. This implies that we should avoid to decode and recompress a media resource to create a fragment. The necessary changes to all software in the media delivery chain should be kept to a minimum: User Agents, Proxies, Media Servers. Focus for necessary changes should be as much as possible on the media servers because in any case they have to implement fragmentation support for the media formats as the most fundamental requirement for providing media fragment addressing. Changes to the user agent need to be a one-off and not require adaptation per media encapsulation/encoding format. A User Agent that does not understand media fragment URIs will simply hand on the URI (potentially with a stripped off fragment part) to the server and receive the full resource in lieu of the fragment. This may lead to unexpected behaviour with media fragment URIs in non-conformant User Agents, e.g. where a mash-up of media fragments is requested, but a sequence of the full files is played. This is acceptable during a transition phase. The fallback plan needs to be clarified. We must be able to handle the way the # is already used, e.g. in YouTube, without breaking what is already working. In which situations do users need media fragment URIs? This section explains the types of user interactions with media resources that media fragment URIs will enable. For each type it shows how media fragment URIs can improve the usefulness, usability, and functionality of online audio and video. In this use case, a user is only interested in consuming a fragment of a media resource rather than the complete resource. A media fragment URI allows addressing this part of the resource directly and thus enables the User Agent to receive just the relevant fragment. Tim does a keyword search on a video search service. That keyword is found in several videos in the search service's collection and it relates to clips inside the videos that appear at a time offset. Tim would like the search result to point him to just these media fragments so he can watch the relevant clips rather than having to watch the full videos and manually scroll for the relevant clips. Michael has a Website that collects recordings of the sittings of his government's parliament. These recordings tend to be very long - generally on the order of 7 hours in duration. Instead of splitting up the recordings into short files by manual inspection of the change of topics or some other segmentation approach, he prefers to provide many handles to a unique video resource. As he publishes the files, however, he provides pagination on the videos such that people can watch them 20 min at a time. Users not only want to receive links to highlights in media resources, but also like to bookmark them in their browsers to be able to get back to them. When regarding media resources (in particular audio and video) as monolithic blocks, they are very inaccessible. For example, it is difficult to find out what they are about, where the highlights are, or what the logical structure of the resources are. Lack of these features, in particular lack of captions and audio annotations, further make the resources inaccessible to disabled people. Introducing an ability to directly access highlights, fragments, or the logical structure of a media resource will provide a big contribution towards making a media resource more accessible. Lena would like to browse the descriptive audio tracks of a video as she does with Daisy audio books, by following the logical structure of the media. Audio descriptions and captions generally come in blocks either timed or separated by silences. Chapter by chapter and then section by section she eventually jumps to a specific paragraph and down to the sentence level by using the "tab" control as she would normally do in audio books. The descriptive audio track is an extra spoken track that provides a description of scenes happening in a video. When the descriptive audio track is not present, Lena can similarly browse through captions and descriptive text tracks which are either rendered through her braille reading device or through her text-to-speech engine. Silvia has a deaf friend, Elaine, who would like to watch the holiday videos that Silvia is publishing on her website. Silvia has created subtitle tracks for her videos and also a segmentation (e.g. using CMML CMML ) with unique identifiers on the clips that she describes. The clips were formed based on locations that Silvia has visited. In this way, Elaine is able to watch the videos by going through the clips and reading the subtitles for those clips that she is interested in. She watches the sections on Korea, Australia, and France, but jumps over the ones of Great Britain and Holland. Elaine has recorded a video mosaic of all her 4 TV channels of an international election day in a single video. She wants to keep the original synchronised file, but now she wants to be able to play back each of the four channels' recordings separately and in sequence. She creates a playlist of media fragments URIs that each select a specific channel in the mosaic to play each channel after one another. Given an ability to link to media fragments through URIs, people will want to decide whether they receive the full resource or just the data that relates to the media fragment. This is particularly the case where the resource is large, where the bandwidth is scarce or expensive, and/or where people have limited time/patience to wait until the full resource is loaded. Erik has a music collection. He creates an "audio podcast" in the form of an RSS feed with URIs that link to samples from his music files. His friends can play back the samples in their Web-attached music players. This scenario is out of scope for this Working Group because the display of the highlighted region is up to the user agent and is not relevant to the network interaction. This particular scenario is already possible with image maps in HTML. Raphael systematically annotates some highlighted regions in his photos that depict his friends, families, or the monuments he finds impressive. This knowledge is represented by RDF descriptions that use spatial fragment URIs to relate to the image fragments in his annotated collection. It makes it possible later to search and retrieve all these media fragment URIs that relate to one particular friend or monument. Raphael also has a collection of audio and video files of all the presentations he ever made. His RDF description collection extends to describing all the temporal segments where he gave a demo of a software system with structured details on the demo. Annotating media resources at the level of a complete resource is in certain circumstances not enough. Support for annotating multimedia on the level of fragments is often desired. The definition of "anchors" (or id tags) for fragments of media resources will allow us to identify fragments by name. It allows the creation of an author-defined segmentation of the resource - an author-provided structure. Raphael would like to attach an RDF-based annotation to a video fragment that is specified through an "anchor". Identifying the media fragment by name instead of through a temporal video fragment URI allows him to create a more memorable URI than having to remember the time offsets. Guillaume uses video fragment URIs in an MPEG-7 sign language profile to describe a moving point of interest: he wants the focus region to be the dominant hand in a Sign Language video. The series of video fragment URIs gives the coordinates and timing of the trajectory followed by the hand, and by naming them, can also describe the areas of changing hand-shapes. Guillaume wants to retrieve the images of each bike present at a recent cycling event. Group photos and general shots of the event have been published online together with detailed RDF annotations. Thanks to a query in a search engine that is able to parse the RDF annotations, Guillaume can now retrieve multiple individual shots of each bike in the collection, where the URI is created based on the RDF annotations. This scenario is out of scope for this Working Group because it requires changes be made to the actual encoded data to retrieve a "fragment". URI based media fragments should basically be achieved through cropping of one or more byte sections. It is possible to develop in future a scheme for such transcoded resources using a URI query (?) specification. Davy is interested to have precise coordinates on his browser address bar to see and pan over large-size images maps. Through the same URI scheme he can now generically address and locate different image subparts on his User Agent for all image types. The support of particular media formats such as TIFF is out of scope - the Working Group only deals with the specification of generic addressing approaches, but support of particular file formats needs to be implemented by the format developers. A spatial fragment URI to an image is, however, in scope. Davy is also interested to have the kind of preview functionality for pictures, in particular these large 10 mega-pixel JPEG files that have embedded thumbnails in them. He can now provide a fast preview by selecting the embedded thumbnail in the original image without even having to resize or create a new separate file! This particular scenario is out of scope for a media fragment URI, since it creates a resource of a different mime type to the original resource. This cannot be done using the URI fragment specifier, but only using the query specifier. This is left as a future exercise. Sebo is Deaf and enjoys watching videos on the Web. Her friend sent her a link to a new music video but she doesn't want to waste time and bandwidth receiving any sounds. So when she enters the URI in her browser's address bar, she also adds an extra parameter to select the video track only. Davy's girlfriend is a fan of Karaoke. She loves to be able to play back videos from the Web that have a karaoke text, and two audio tracks, one each for the music and for the singer. She practices the songs by playing back the complete video with all tracks, but uses the video in Karaoke parties with friends where she turns off the singer's audio track through a simple selection of tracks in the User Agent. This section describes the list of required media fragment addressing dimensions that have resulted from the use case analysis. It further analyses what format requirements the media resources has to adhere to in order to allow the extraction of the data that relates to that kind of addressing. A temporal fragment of a media resource is a clipping along the time dimension from a start to an end time that are within the duration of the media resource. Whether a media resource supports temporal fragment extraction is in the first place dependent on the coding format and more specifically how encoding parameters were set. For video coding formats, temporal fragments can be extracted if the video stream provides random access points (i.e., a point that is not dependent on previously encoded video data, typically corresponding to an intra-coded frame) on a regular basis. The same holds true for audio coding formats, i.e., the audio stream needs to be accessible at a point where the decoder can start decoding without the need of previous coded data. A spatial fragment of a media resource is a clipping of an image region. For media fragment addressing we only regard rectangular regions. Support for extraction of spatial fragments from a media resource in the compressed domain depends on the coding format. The coding format must allow to encode spatial regions independently from each other in order to support the extraction of these regions in the compressed domain. Note that there are currently two variants: region extraction and interactive region extraction. In the first case, the regions (i.e., Regions Of Interest, ROI) are known at encoding time and coded independently from each other. In the second case, ROIs are not known at encoding time and can be chosen by a user agent. In this case, the media resource is divided in a number of tiles, each encoded independently from each other. Subsequently, the tiles covering the desired region are extracted from the media resource. A typical media resource consists of multiple tracks of data multiplexed together into the media resource. A media resource could for example consist of several audio, several video, and several textual annotation or metadata tracks. Their individual extraction / addressing is desirable in particular from a media adaptation point of view. Whether the extraction of tracks from a media resource is supported or not depends on the container format of the media resource. Since a container format only defines a syntax and does not introduce any compression, it is always possible to describe the structures of a container format. Hence, if a container format allows the encapsulation of multiple tracks, then it is possible to describe the tracks in terms of byte ranges. Examples of such container formats are Ogg RFC 3533 and MP4. Note that it is possible that the tracks are multiplexed, implying that a description of one track consists of a list of byte ranges. Also note that the extraction of tracks (and fragments in general) from container formats often introduces the necessity of syntax element modifications in the headers. A named fragment of a media resource is a media fragment - either a track, a time section, or a spatial region - that has been given a name through some sort of annotation mechanism. Through this name, the media fragment can be addressed in a more human-readable form. No coding format provides support for named fragments, since naming is not part of the encoding/decoding process. Hence, we have to consider container formats for this feature. In general, if a container format allows the insertion of metadata describing the named fragments, then the container format supports named fragments, if the fragment class is also supported. For example, you can include a CMML CMML or TimedText description in an MP4 or Ogg RFC 3533 container and interpret this description to extract temporal fragments based on a name given to them in the description. There is a large number of media codecs and encapsulation formats that we need to take into account as potential media resources on the Web. This section analyses the general conditions for media formats that make them fit for supporting the different types of fragment URIs. The media fragments can be extracted in the compressed domain. No syntax element modifications in the bitstream are needed to perform the extraction. Fit: The media resource meets the two conditions (i.e., fragments can be extracted in the compressed domain and no syntax element modifications are necessary). In this case, caching media fragments of such media resources on the byte level is possible. Conditionally fit: Media fragments can be extracted in the compressed domain, but syntax element modifications are required. These media fragments provide cacheable byte ranges for the data, but syntax element modifications are needed in headers applying to the whole media resource/fragment. In this case, these headers could be sent to the client in the first response of the server. Unfit: Media fragments cannot be extracted in the compressed domain as byte ranges. In this case, transcoding operations are necessary to extract media fragments. Since these media fragments do not create reproducible bytes, it is not possible to cache these media fragments. Note that media formats which enable extracting fragments in the compressed domain, but are not compliant with category 2 (i.e., syntax element modifications are not only applicable to the whole media resource), also belong to this category. Those media types that are capable of doing what server-side media fragments require are of interest to us. For those that aren't, the fall-back case applies (i.e. full download and then offsetting). Appendix B Evaluation of fitness per media formats lists a large number of typical formats and determines which we see fit, conditionally fit, or currently unfit for supporting the different types of media fragment URIs. We ask for further input into the table in the attachment, in particular where there are question marks. This section describes the external representation of a media fragment specifier, and how this should be interpreted. The first two subsections are a semi-informal introduction, with the formal grammar and detailed semantics being specified in the last two subsections. To name a media fragment, one needs to find ways to convey this information. Our solution builds on URIs as of RFC 3986 and hence there are two possibilities for representing the media fragment addressing: the URI query part or the URI fragment part. As of this writing, the group has a preference to use the URI fragment part, because this maintains the relationship between the main resource and the media fragment. Using the query part would result in a new resource being created. Hence, hash (#) is used as the separator between the base URI and the media fragment. The fragment identifier consists of a list of name/value pairs, the dimension specifiers, separated by the primary separator &. Name and value are separated by an equal sign (=). In case value is structured, colon (:) and comma (,) are used as secondary separators. No whitespace is allowed (except inside strings). this dimension denotes a named section of the original media, such as "chapter 2". Note that the track dimension refers to one of a set of parallel media streams ("the english audio track for a video"), not to a, possibly self-contained, section of the source media ("Audio track 2 of a CD"). The self-contained section is handled by the name dimension. The name dimension cannot be combined with other dimensions for this version of the media fragments specification. Projection along the other three dimensions is logically commutative, therefore they can be combined, and the outcome is independent of the order of the dimensions. Each dimension can be specified at most once. The name dimension cannot be combined with the other dimensions, because the semantics depend on the underlying source media format: some media formats support naming of temporal extents, others support naming of groups of tracks, etc. Error semantics are discussed in 6.4 Semantics. Temporal clipping is denoted by the name t, and specified as an interval with a begin time and an end time (or an in-point and an out-point, in video editing terms). Either or both may be omitted, with the begin time defaulting to 0 seconds and the end time defaulting to the duration of the source media. The interval is half-open: the begin time is considered part of the interval whereas the end time is considered to be the first time point that is not part of the interval. Temporal clipping can be specified either as Normal Play Time (npt) or as SMPTE timecodes, SMPTE . Begin and end times are always specified in the same format. The format is specified by name, followed by a colon (:), with npt: being the default. In this version of the media fragments specification there is no extensibility mechanism to add time format specifiers. Normal Play Time can either be specified as seconds, with an optional fractional part and an optional s to indicate seconds, or as colon-separated hours, minutes and seconds (again with an optional fraction). Minutes and seconds must be specified as exactly two digits, hours and fractional seconds can be any number of digits. The hours, minutes and seconds specification for NPT is a convenience only, it does not signal frame accuracy. Do we need a rationale, to explain that we picked this syntax for timecodes up from rtsp and smil? SMPTE timecodes are a way to address a specific frame (or field) without running the risk of rounding errors causing a different frame to be selected. The format is always colon-separated hours, minutes, seconds and frames. Frames are optional, defaulting to 00. If the source format has a further subdivison of frames (such as odd/even fields in interlaced video) these can be specified further with a number after a dot (.). The SMPTE format name must always be specified, because the interpretation of the fields depends on the format. The SMPTE formats supported in this version of the specification are: smpte, smpte-25, smpte-30 and smpte-30-drop. smpte is a synonym for smpte-30. Using SMPTE timecodes may result in frame-accurate begin and end times, but only if the timecode format used in the media fragment specifier is the same as that used in the original media item. Spatial clipping selects an area of pixels from visual media streams. For this release of the media fragment specification, only rectangular selections are supported. The rectangle can be specified as pixel coordinates or percentages. Alternatively, there is a way to request cropping to a centered area with a specified aspect ratio. Rectangle selection is denoted by the name xywh. The value is an optional format pixel: or percent: (defaulting to pixel) and 4 comma-separated integers. The integers denote x, y, width and height, respectively, with x=0, y=0 being the top left corner of the image. If percent is used, x and width are interpreted as a percentage of the width of the original media, and y and height are interpreted as a percentage of the original height. Centered selection is denoted by the name aspect, the value being colon-separated width and height ratios. The original media are cropped either horizontally or vertically to the maximum size that has the given aspect ratio. Track selection allows the extraction of a single track (audio, video, subtitles, etc) from a media container that supports multiple tracks. Track selection is denoted by the name track. The value is a string enclosed in single quotes. Percent-escaping can be used in the string to specify unsafe characters, see the grammer below for details. Interpretation of the string depends on the container format of the original media: some formats allow numbers only, some allow full names. As the allowed track names are determined by the original source media, this information has to be known before construction of the media fragment. There is no support for generic media type names (audio, video) across container formats: most container formats allow multiple tracks of each media type, which would lead to ambiguities. The issue of generic track names is still under discussion, ISSUE-4 in the tracker has the details. Name-based selection is denoted by the name id, with the value being a string enclosed in single quotes. Percent-escaping can be used in the string to include unsafe characters such as single quote, see the grammer below for details. Interpretation of the string depends on the underlying container format: some container formats support named chapters or numbered chapters (leading to temporal clipping), some may support naming of groups of tracks or other objects. As with track selection, determining which names are valid requires knowledge of the original media item. Note that, despite the use of the name id, there is no correspondence to XML id: the values are uninterpreted strings, from the point of view of media fragment handling. In this section we present the ABNF ( ABNF ) syntax for a media fragment specifier. The names for the non-terminals more-or-less follow the names used in the previous subsections, with one clear difference: the start symbol is called mediasegment, because we want to leave open the possibility of reuse in a URI query in addition to the current use in a URI fragment. ; in the axisfragment definition, unless we list explicitely the 14 cases. timeprefix    = %x74                                      ; "t"
deftimeformat = %x6E.70.74                                ; "npt"
timeformat    = %x73.6D.70.74.65                          ; "smpte"
timeunit      = %x73                                      ; "s"
xywhprefix    = %x78.79.77.68                             ; "xywh"
aspectprefix  = %x61.73.70.65.63.74                       ; "aspect"
xywhunit      = %x70.69.78.65.6C                          ; "pixel"
trackprefix   = %x74.72.61.63.6B                          ; "track"
nameprefix    = %x69.64                                   ; "id"
For this version of the working draft, this section is incomplete and unstructured. We expect to fill in more details as we gain implementation experience. We also specifically request feedback from readers of this draft: if you notice errors, omissions, choices that are sub-optimal for some application area of media fragments or choices that you feel will cause implementation difficulties: please let us know. The mimetype of the fragment should be the same as the mimetype of the source media. Among other things, this means that selection of a single video frame results in a movie, not in a still image. Implementations are expected to first do track and time selection, on the container level, and then do spatial clipping on the codec level. Preferrably, clipping should be implemented without transcoding, provided the result in reasonably close to what was requested in the media fragment URI. This statement requires definition of "reasonable", which is TBD. 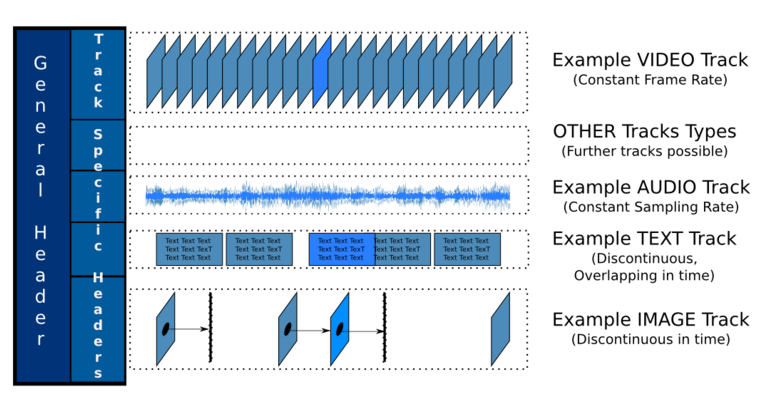 The idea is that it is OK to have a video start half a second earlier than specified if that happens to be where an I-frame is, or an audio block boundary. For some container formats this is a non-issue, because the container format allows specification of logical begin and end. We need to say something on whether A/V sync needs to be maintained, and to what granularity. This has consequences for transcoding. We may need to say something on whether embedded timecodes in media streams (or as a separate timecode stream) are expected to be maintained (or not, or implementation-defined). Attempting to do fragment selection on a dimension that does not exist in the source media, such as temporal clipping on a still image, should be considered a no-op. The result of doing spatial clipping on a source media that has multiple video tracks is undefined if no track selection is also applied. Incompatible: if the named dimension is used, all the other dimensions are ignored. Alternatively: this is an error. The first proposal is based on the definition of (new) custom HTTP range units, defined along the different axis suitable to describe media fragments. This can be translated in one single roundtrip (or single-step partial GET). The second proposal is based on the HTTP byte ranges in range request/responses that will direct the client on how and where to get all the data needed to construct a fragment. This generally means at least two roundtrips (or dual-step partial GET). Unfortunately, no approach is vastly superior, so the solution might be to use both, depending on which problem a Web application is trying to solve. Other concerns to deal with are the cachability of the resource. The user agent will then have to skip 0.15s to start playing the multimedia fragment as 12s. Origin Server converts time range to byte range and puts all header data, occurring at the beginning of the media resource, that cannot be cached but is required by the UA to receive a fully functional media resource into the HTTP response. It also replies with a X-Accept-TimeURI header that indicates to the client that it has processed the time request and converted to bytes (similarly this could be extended to X-Accept-SpaceURI, X-Accept-TrackURI and X-Accept-NameURI). The message body of this answer contains the control section of fragf2f.mp4#12,21 (if required). The UA hands over the header and video data to the media subsystem and therefore display it to the user (9). Single-step partial GET usually achieves what we want without needing HTTP protocol extension for any resource with an intrinsic time → data map such as .mov, .mp4. In both cases, we create a custom Range unit (e.g. 'seconds'). We would need to create custom range unit to convey the notion of seconds, pixels, tracks, etc. Using HTTP byte ranges to request media fragments enables existing HTTP proxies and caches to inherently support the caching of media fragments. This approach is possible if a dual-step partial GET is applied. This method, however, does not deliver complete resources, but rather generates an infinite number of resources to create the control section of the transmitted fragments, and extra care is needed when fetching different part to avoid fetching data from changing resources. Those new resources containing the control section of the fragments to be retrieved form an other resource that needs to be known by all clients, which has a big implementation cost, but has no impact on Caches. The media resource meets the two conditions (i.e., fragments can be extracted in the compressed domain and no syntax element modifications are necessary). In this case, caching media fragments of such media resources is possible using HTTP byte ranges, because their media fragments are addressable in terms of byte ranges. Media fragments can be extracted in the compressed domain, but syntax element modifications are required. These media fragments are cachable using HTTP byte ranges on condition that the syntax element modifications are needed in media-headers applying to the whole media resource/fragment. In this case, those media-headers could be sent to the client in the first response of the server, which is a response to a request on a specific resource different from the byte-range content. Media fragments cannot be extracted in the compressed domain. In this case, transcoding operations are necessary to extract media fragments. Since these media fragments are not expressible in terms of byte ranges, it is not possible to cache these media fragments using HTTP byte ranges. Note that media formats which enable extracting fragments in the compressed domain, but are not compliant with category 2 (i.e., syntax element modifications are not only applicable to the whole media resource), also belong to this category. Some existing URI schemes define semantics for fragment identifiers. In this section, we list these URI schemes and provide examples of their fragment identifiers. cited from RFC3986: "The fragment identifier component of a URI allows indirect identification of a secondary resource by reference to a primary resource and additional identifying information. The identified secondary resource may be some portion or subset of the primary resource, some view on representations of the primary resource, or some other resource defined or described by those representations. A fragment identifier component is indicated by the presence of a number sign ("#") character and terminated by the end of the URI." In this section, we list a number of proprietary URI schemes which are able to identify media fragments. Note that all of these schemes only provide support for addressing temporal media fragments. SMIL Yes Yes No? No? SVG No Yes No ? ImageMaps No Yes No ? offset() is applicable to any digital resource and identifies a range of bytes in a data stream (similar functionality as the HTTP byte range mechanism). a set of so-called dimensions (i.e., temporal, spatial or spatiotemporal) which are independent of the coding/container format: for the temporal dimension, the following time schemes are supported: NPT, SMPTE, MPEG-7, and UTC. a hierarchical logical model of the resource. Such a logical model is dependent on the underlying container format (e.g., audio CD contains a list of tracks). The structures defined in these logical models are accessed with a syntax based on XPath. mask() is applicable for media resources whose Internet media type (or MIME type) is equal to video/mp4 or video/mpeg and addresses a binary mask defined in a resource (binary masks can be achieved through MPEG-4 shape coding). Note that this mask is meant to be applied to a video resource and that the video resource may itself be the resource that contains the mask. Note that hierarchical combinations of addressing schemes are also possible. The '*' operator is used for this purpose. When two consecutive pointer parts are separated by the '*' operator, the fragments located by the first pointer part (to the left of the '*' operator) are used as a context for evaluating the second pointer part (to the right of the '*' operator). Jumping to #tic2area will start the video at the beginning of the interesting section. The presentation will not stop at the end, however, it will continue. This construct can be combined with the temporal clipping. It is possible to change the panZoom rectangle over time. The following code fragment will show the full video for 10 seconds, then zoom in on the center quarter over 5 seconds, then show that for the rest of the duration. The video may be scaled up or centered, or something else, depending on SMIL layout, but this is out of scope for the purpose of this investigation. The following bit of code will enable the top-right quarter of the video to be clicked to follow a link. Note the difference in the way the rectangle is specified (left, top, right, bottom) when compared to panZoom (left, top, width, height). This is an unfortunate side-effect of this attribute being compatible with HTML and panZoom being compatible with SVG. Other shapes are possible, as in HTML and CSS. The spatial and temporal constructs can be combined. The spatial coordinates can be animated, as for panZoom. SMIL has no way to selectively enable or disable tracks in the video. It only provides a general parameter mechanism which could conceivaby be used to comminucate this information to a renderer, but this would make the document non-portable. Moreover, no such implementations are known. For all dimensions covered by MPEG-7 the use of indirection should not forgotten. http://www.example.com/mpeg7file.mp7#speaker refers to the "speaker" xml element of this resource. The UA needs to parse this element in order to actually point to this fragment. A video is divided into VideoSegments that can be described by a timestamp. MediaTimes are described using a MediaTimePoint and MediaDuration, which are the starting time and shot duration respectively. The MediaTimePoint is defined as follows: YYYY-MM-DDThh:mm:ss:nnnFNNN (Y: year, M: month, D: day, T: a separation sign between date and time, h: hours, m: minutes, s: seconds, F: separation sign between n and N, n: number of fractions, N: number of fractions in a second). The MediaDuration is defined as follows: PnDTnHnMnSnNnF with nD number of days, nH number of hours, nM number of minutes, nS number of seconds, nN number of fractions and nF fractions per second. The temporal fragments can also be defined in Time Units or relative compared to a defined time. This MPEG-7 example describes a 'shot1' starting at 6sec 2002/2500 sec and lasts for 9sec 13389/25000 sec. Selecting a spatial fragment of the video is also possible, using a SpatialDecomposition-element. This MPEG-7 example describes a spatial (polygonal) mask called "speaker" which is given by the coordinates of the polygon: (40, 300), (40,210), ..., (320,300). The spatial video fragment can be combined with temporal information thus creating a SpatialTemporalDecomposition-element. Media fragments can be identified by their id. SVG relies either on SMIL or HTML5 as a foreign object to introduce temporal media fragmentation. It has no temporal fragmentation of its own. One can add a video to a scene (as can be seen in example 2). Although it is possible to add a foreign object within SVG wherein HTML5 video elements can be added. This is (at the moment) not a solution for temporal segmentation as HTML does not support it either. <"image" id="image_yalta" x="-0.34" y="0.20" width="400" height="167"
<"rect" id="SR1" x="14.64" y="15.73" width="146.98" height="147.48"
SegmentLocator locates the segment within a programme (instance) in terms of start time and duration (optional). If the duration is not specified, the segment ends at the end of the programme. Note that the types of MediaRelTimePoint and MediaDuration correspond to the MPEG-7 types MediaRelTimePointType and MediaDurationType respectively. Currently, HTML5 relies on the abilities of the used media format for providing media fragment addressing. In future, HTML5 is planning to adopt the fragment URI specifications of this document for providing fragment addressing. Input from the WHAT and HTML working groups is requested. S. Bradner. Key Words for use in RFCs to Indicate Requirement Levels . IETF RFC 2119, March 1997. Available at http://www.ietf.org/rfc/rfc2119.txt. The Ogg Encapsulation Format Version 0 . IETF RFC 3533, May 2003. Available at http://www.ietf.org/rfc/rfc3533.txt. T. Berners-Lee and R. Fielding and L. Masinter. Uniform Resource Identifier (URI): Generic Syntax . IETF RFC 3986, January 2005. Available at http://www.ietf.org/rfc/rfc3986.txt. E. Wilde and M. Duerst. URI Fragment Identifiers for the text/plain Media Type . IETF RFC 5147, April 2008. Available at http://tools.ietf.org/html/rfc5147. D. Ragett and A. Le Hors and I. Jacobs. HTML Fragment identifiers . W3C Rec, December 1999. Available at http://www.w3.org/TR/REC-html40/intro/intro.html#fragment-uri. J. Ferraiolo. SVG Fragment identifiers . W3C Rec, September 2001. Available at http://www.w3.org/TR/2001/REC-SVG-20010904/linking#FragmentIdentifiersSVG. P. Grosso and E. Maler and J. Marsh and N. Walsh. XPointer Framework . W3C Rec, March 2003. Available at http://www.w3.org/TR/xptr-framework/. Information Technology - Multimedia Content Description Interface (MPEG-7) . Standard No. ISO/IEC 15938:2001, International Organization for Standardization(ISO), 2001. S. Pfeiffer and C. Parker and A. Pang. Specifying time intervals in URI queries and fragments of time-based Web resources . Internet Draft, March 2005. Available at http://annodex.net/TR/draft-pfeiffer-temporal-fragments-03.html. Continuous Media Markup Language (CMML), Version 2.1 . IETF Internet-Draft 4th March 2006 http://www.annodex.net/TR/draft-pfeiffer-cmml-03.txt. Rich Open multitrack media Exposition (ROE) . Xiph Wiki. Retrieved 13 April 2009 at http://wiki.xiph.org/index.php/ROE. Ogg Skeleton . Xiph Wiki. Retrieved 13 April 2009 at http://wiki.xiph.org/OggSkeleton. Information Technology - Multimedia Framework (MPEG-21) . Standard No. ISO/IEC 21000:2002, International Organization for Standardization(ISO), 2002. Available at http://www.chiariglione.org/mpeg/working_documents/mpeg-21/fid/fid-is.zip. Augmented BNF for Syntax Specifications: ABNF , Internet STD 68 (as of April 2009: RFC 5234). In order to get a view on which media formats belong to which fitness category, an overview is provided for key media formats. In the following tables, the 'X' symbol indicates that the media format does not support a particular fragment axis. The tables are separated by video/audio/image codecs and container formats. Motion JPEG2000 n/a fit unfit n/a Spatial fragment extraction is possible in the compressed domain, but syntax element modifications are needed for every frame. Dirac n/a fit unfit n/a When Dirac is stored in the Ogg RFC 3533 container using Skeleton Skeleton , ROE ROE and CMML CMML , track, temporal and named fragments are supported. Theora n/a fit unfit n/a When Theora is stored in the Ogg RFC 3533 container using Skeleton Skeleton , ROE ROE and CMML CMML , track, temporal and named fragments are supported. Vorbis n/a fit n/a n/a When Vorbis is stored in the Ogg RFC 3533 container using Skeleton Skeleton , ROE ROE and CMML CMML , track, temporal and named fragments are supported. FLAC n/a fit n/a n/a When FLAC is stored in the Ogg RFC 3533 container using Skeleton Skeleton , ROE ROE and CMML CMML , track, temporal and named fragments are supported. Speex n/a fit n/a n/a When Speex is stored in the Ogg RFC 3533 container using Skeleton Skeleton , ROE ROE and CMML CMML , track, temporal and named fragments are supported. RMFF fit or conditionally fit(?) n/a n/a ? XMF ? n/a n/a ? This document is the work of the W3C Media Fragments Working Group. The people who have contributed to discussions on public-media-fragment@w3.org are also gratefully acknowledged. In particular: Pierre-Antoine Champin, Ken Harrenstien, Henrik Nordstrom, Sam Sneddon and Felix Sasaki.